There hasn’t been any exciting news on the 2016 Ford Mustang coming out of the 2015 New York International Auto Show, but a new report states that there will be a new GT/California Special package offered for the 2016 model year. The Ford Mustang GT California Special was first introduced for the California market back in 1968, but due to the popularity of the package, other markets on the west side of the Mississippi in the US and Canada. 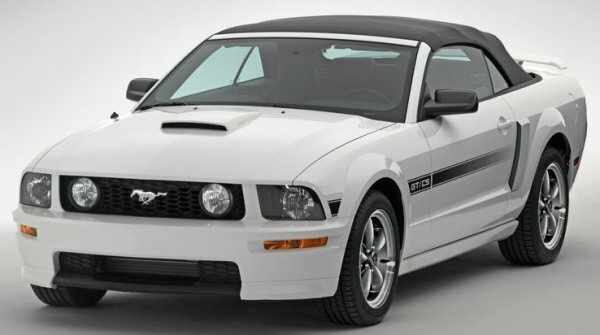 The original GT/CS was celebrated in 2007 when the Mustang GT/CS was introduced (shown above), but unlike the original, the GT/CS package was available all over the country. That GT/CS was available from 2007-2009 and then again in 2011-2012 with a slightly different look. Finally, the 2013 and 2014 model years brought about the most minimally decorated GT/CS models. When the 2015 Ford Mustang was introduced, there was no mention of a GT/CS package, but according to the folks at AutoEvolution.com, there is a 2016 Mustang GT/CS on the way. Mind you, this piece was posted on April 1st, but I didn’t see any other April Fool’s Day jokes on that site yesterday so when combined with the simplicity of the report – I am inclined to believe that it is real. According to this new report, the 2016 Ford Mustang GT/CS should get some slightly restyled front and rear fascias, a subtle rear spoiler, a unique wheel package, GT/CS striping along the sides, a dressed up interior and a GT/CS rear “Gas cap” cover between the taillights. I would also expect a slight grille filler redesign for the California Special package, but any external changes are likely to be very minimal. Of course, the 2016 Ford Mustang GT/CS will feature the drivetrain of the 2015 Mustang GT, packing a 435 horsepower 5.0L V8 and your choice of either a 6-speed manual or automatic transmission. The GT/CS package for the 2014 Mustang carried a price of $1,995, but it was only available with the GT Premium package. I would expect the same to be true of the 2016 GT/CS package, although the price could be a skosh higher if the package includes unique front and rear fascias. The 2016 Ford Mustang GT/CS wouldn’t pack the same level of exclusivity as the 1968 models, but neither have those examples sold in 2007-2014. Instead, the 2016 GT/CS package will give new Mustang buyers who want a little more sporty style than what is offered with the standard Mustang GT. While we know that the new Ford Shelby GT350 Mustang will arrive late in 2015, we still don’t know what it will go on sale or when it will it begin reaching dealerships. The reports that indicate that the 2016 Mustang order banks will open on May 11th, but some of those reports have stated that the Shelby models are not included in the first wave of orders. Should any more information come up on the 2016 Ford Mustang, you will find it here on TorqueNews.com.